Transport Models - Scania CP28 Pump Ladder. 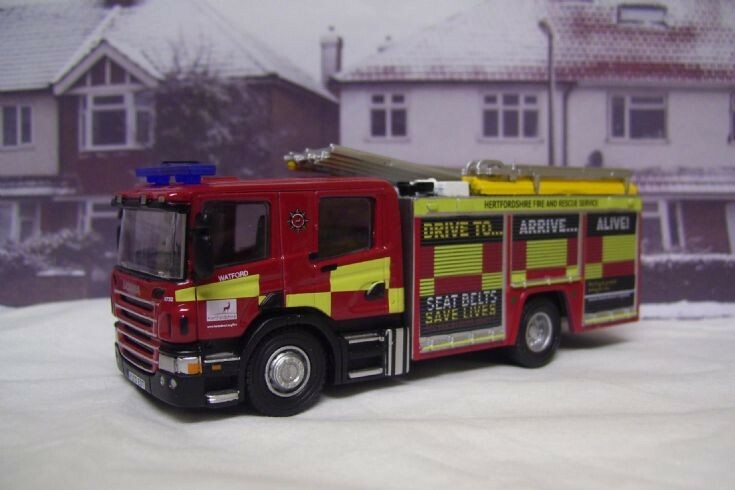 This new model in 1/76 scale is from the Atlas Edition Collection and shows in this typical winter scene a 2010 Scania CP28 Pump Ladder of the Hertfordshire Fire and Rescue Service. This actual appliance is located at the station in Watford and displays warnings about wearing seat belts to arrive safely at your destination. Drive to......Arrive......Alive.This at this time of year could also mean....Don't Drink and Drive. All the very best for Christmas to you all,and A Happy New Year. Could you please tell me where I could purchase model I have seen on e bay but was out bidded amd as soon as they are for sale they go straight away . I have been in contact with oxford diecast and they gave me the atlas email address but dosnt appear to exist.ALso do you kno the supplier af the road safety signs that are advertised on this appliance thank you for your assisitance re my request. Added by Adrian Barker on 17 March 2015. Adrian, is this the model you want?, I will contact you via your email address sometime over the weekend.Pete. Added by Pete Matten on 20 March 2015. Adrian, sorry I am unable to contact you via your email address, or connecting by clicking through your name above.Try if you wish by clicking on my name for email address should you wish to contact me. Added by Pete Matten on 22 March 2015. Added by Edward Weeks on 09 March 2016. This model sometimes comes available on eBay, also seen at some toy fairs recently going for a lot less then the original price by Atlas. Added by Pete Matten on 14 March 2016. How much to buy it? Added by Shaun Tucker on 14 March 2018. I’ve had one on eBay for £16 & paid up to £45. Only have one left in the collection now & they don’t come up on eBay that often. Added by Edward Weeks on 15 March 2018.